How do you locate a point on the plane? One way of doing this, which you’re probably familiar with, it to use the Cartesian coordinate system. Draw two perpendicular axes and describe the location of a point by two coordinates . To find you start at the point and walk a distance along the horizontal axis and a distance along the vertical axis. But there’s another way of locating points on the plane, which is very nice too. To each point assign the pair of numbers , where is the distance from to along a straight radial line, and is the angle formed by that radial line and the positive -axis, measured anti-clockwise from the -axis to the line. These new coordinates are called polar coordinates, because you treat the crossing point of the axes as a pole from which everything radiates out. In the image below, click on the point and drag it around to see how its polar coordinates change (degrees are measured in radians). Some shapes that are hard to describe in Cartesian coordinates are easier to describe using polar coordinates. For example, think of a circle of radius centred on the point . It is made up of all the points that lie a distance from . In polar coordinates these are all the points with coordinates , where can take any value at all. A circle. It is made up of all points whose Cartesian coordinates (x, y) satisfy x2+y2= 4 and whose polar coordinates (r, θ) satisfy r=2. 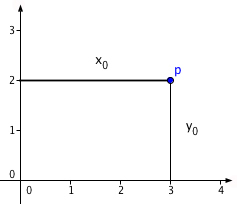 The points shown has Cartesian coordinates (√2, √2) and polar coordinates (2,45), with the angle measured in degrees. Another nice example comes from looking at all the points whose first polar coordinate is equal to the second polar coordinate. In other words, all points of the form As grows, the point moves further out from the point The angle grows at the same rate. As becomes larger, the angle turns round and round the point . The result is an Archimedean spiral. The movie below shows the points with coordinates , as grows from to (which corresponds to ten full turns of ). It’s a lot harder to describe such an Archimedean spiral in Cartesian coordinates! 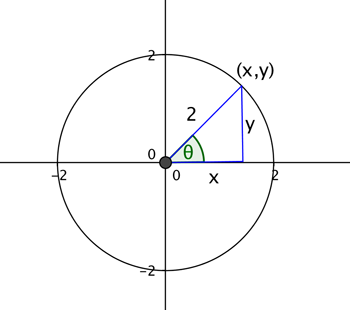 Finally, we look at points whose second polar coordinate is equal to , where is the second polar coordinate and is the base of the natural logarithm. In this case, the first coordinate (the distance from the corresponding point to ) grows faster than the second coordinate (the angle). The result is a spiral whose turns aren’t as tight as that of an Archimedean spiral — it’s an example of a logarithmic spiral. The movie below shows the points with coordinates , as grows from to (corresponding to four full turns). See Polar power for more about Archimedean and logarithmic spirals, as well as other interesting shapes you can draw with polar coordinates. What are the polar coordinates of the origin? You always refer to the origin as (0,0) but these are Cartesian coordinates. I think that (0,0) is perfectly serviceable as the polar coordinates, since we can reason a radius of 0 from the origin, with an angle of 0 radians. The origin in polar co-ordinates is an improvement on Cartesian coordinates (0, θ) is the origin for any θ. It contains (for continuous curves) information about the angle at which a curve intersected with the origin, which can actually be an important fact for sketching the curve.